Sharing my latest Bolivia blog post on Facebook. Under the iPad is my father-in-law’s laptop. For 10 years my family has traveled to Bolivia regularly to see family and friends. Last month we returned for a three-week vacation. As our family has grown, so has the expense of the flights. Consequently the interval between trips has increased as well. Our previous trip was in 2010. Planning for the 2013 trip, I wanted to take much better-quality photos and (especially) videos than before. I thought it might be interesting to write a blog post looking back at what technology we used on past trips, the upgrade choices we made this time, and our end results. I bought my Pismo PowerBook G3 used 10 years ago for my very first trip to Bolivia. During that five-week adventure, I used it to design websites and brochures, to listen to music, to play games, and to blog — over dial-up internet. I would haul the Pismo along for our next six trips to Bolivia. Until 2008, we always shot photos with a film point-and-shoot camera. On a typical trip, we would go to downtown Santa Cruz to have the photos developed on CD after completing several rolls of film. Once we had the photos on CD, I would post the photos to our Bolivia blog. In late 2005, we added a video camera: a Sony HandyCam, shooting on DV tape. Our strategy with DV tape was to shoot clip-style. Once we returned home we would import all the tapes and edit the video on our PowerMac G3. In those early days, we had enough free time for video editing after a trip. Our next upgrade came in 2008 when we bought our first digital point-and-shoot: a Canon PowerShot A590. The quality of our photos greatly improved, and we were able to edit almost immediately while we were in Bolivia on the Pismo. In Bolivia we often stayed at El Jordán, a support center for street kids where Yoli used to help. In 2010 one of their volunteers got wi-fi, which she allowed us to borrow. For the first time we could upload photos to the blog the same day we shot them. In 2011 I got an iPad 2. Since then it has become my video workhorse. I love how convenient it has been to shoot video on the iPad and then immediately edit my clips in iMovie. So much faster than the long DV tape imports we endured with the HandyCam (which had begun eating tapes). When I visited England with my mom and grandmother in 2012, I didn’t bring the laptop. I used the iPad exclusively to shoot and edit videos, to edit photos, and to blog. This worked out well. My only complaint was my poor iPad typing skills. So, I wanted better quality for our 2013 Bolivia adventure, which necessarily meant I would need a better camera. I decided to buy my first DSLR, the micro-4/3 Olympus E-PL5, based on reviews I read (notably that of Shawn Blanc). I would use it to shoot both photos and video. But better quality also means much larger files. There was no question of bringing the Pismo: it might edit the photos (slowly), but it would completely choke on the 1080p video. The question I debated was: would the iPad 2 be enough to do everything, or should I consider getting a new laptop to handle the editing chores? Given my experience in England, my preference for traveling light, and my reticence to spend more money after shelling out for the camera and accessories, I decided against buying a new laptop. I would stick to the iPad. Still, I worried about my editing workflow. It wasn’t iMovie for iOS that concerned me (it’s a fantastic app), but rather my dearth of storage space. My iPad 2 is the 16-gig model, and much of that space would be consumed by apps, games, and a few TV programs to keep the kids entertained during our travel days. There certainly would not be room to store lots of finished 1080p videos. Edit photos only, and leave all the video clips until after vacation. The problem with Option 1 is the state of Bolivian internet connections. Yes, we would have wi-fi in the guesthouse where we would be staying — but how fast would it be? Option 2 didn’t appeal to me. I wanted to use downtime during the trip to edit clips and make videos. I didn’t want to real life with a pile of videos to edit, that would likely never get done. I decided to try option 1, so I paid for 1 month of a Vimeo pro account. Video would be a Hail Mary. 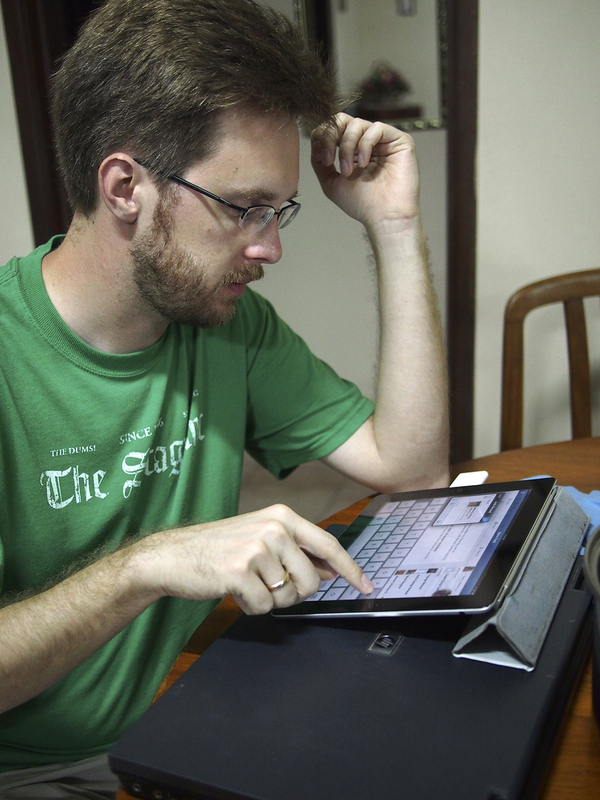 I’d try editing some short videos on the iPad, and then try uploading them to Vimeo. If it worked, I might try to do longer videos as well. If not, then I’d just wait to edit video until I got home. In practice, the photo-editing worked great. Our internet connection provided reliable enough to upload photos (I usually downsized them to 1024px wide for the blog). The video-editing was less successful. The iPad proved it was up to the 1080p editing challenge. I didn’t notice any slowdowns on any videos I edited, though admittedly I kept everything under 2 minutes long. But uploading the finished work was a different story. Using iMovie’s “Export to Vimeo” option was frustrating. It never worked during the day because the connection was slow — and even if it had worked, this option doesn’t work in the background, so I couldn’t have used the iPad for anything else while it was uploading. Consequently I had to upload videos overnight. Each upload would take many hours. Sometimes they worked. Other times I would find a timeout error message in the morning. One video took more than a week of trying before it uploaded. At one point in the trip I took my father-in-law’s Windows 7 laptop back to the guesthouse to set up some games and apps on it for him. I was pleased to discover the uploader on Vimeo’s website worked well on the laptop. It didn’t matter that our internet was slow and sometimes cut out for a few seconds. This robust browser uploader continued uploading despite the problematic connection. After this experience, I tried to Vimeo’s website on my iPad, but the browser uploader didn’t work for me in Mobile Safari. End result? I edited and uploaded tons of photos. I edited seven videos — and successfully uploaded five. The rest of the video clips I left on the SDHC cards for editing after the trip. The iPad edited photos and videos like a champ, but the lack of storage space was a problem. iMovie for iOS’s Vimeo uploader is a pain; it doesn’t tolerate poor internet connections. For the next trip I’ll probably consider buying a new laptop and bringing it along. This entry was posted in Uncategorized and tagged bolivia, camera, pismo powerbook, reminiscence, travel on Jul. 17, 2013 .